The well-guarded little secret of recently built New York apartments at swank addresses is that the interiors are often banal and the construction iffy, the result of developers designing buildings with their calculators. The apartments coast on drop-dead views. 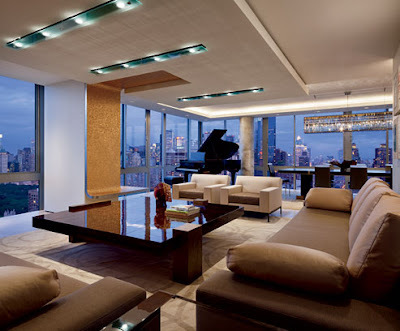 Here on the Upper West Side, a hop, skip and a jump from Lincoln Center, the clients wanted to reset the equation so that the interiors matched the views in quality and drama as they achieved a higher environmental IQ. An energy-consuming Manhattan apartment could go green. New Yorkers called on Hariri & Hariri Architecture to design a Modernist apartment on the 45th floor of a Manhattan tower, the clients asked for environmental intelligence. Collectors and travelers, the couple brought a sophisticated eye to the commission, matched by elevated environmental expectations. They had stayed in many hotels wired to optimize comfort and minimize energy consumption.